Agave plants are best known as succulent plants with large leaves that end in spiny tips. At first glance, you probably wouldn’t call agave plants rosettes, although they are. So many of the common ones are spiny succulents, with leaves that jut out in often dangerous spikes. There is a lot of variety in the agave genus. There are the large, stiff specimens that can grow to 20 feet in diameter. There are also small dish-sized agaves, and agave plants with soft leaves and no spines, although most do have leaves that end in a sharp point. 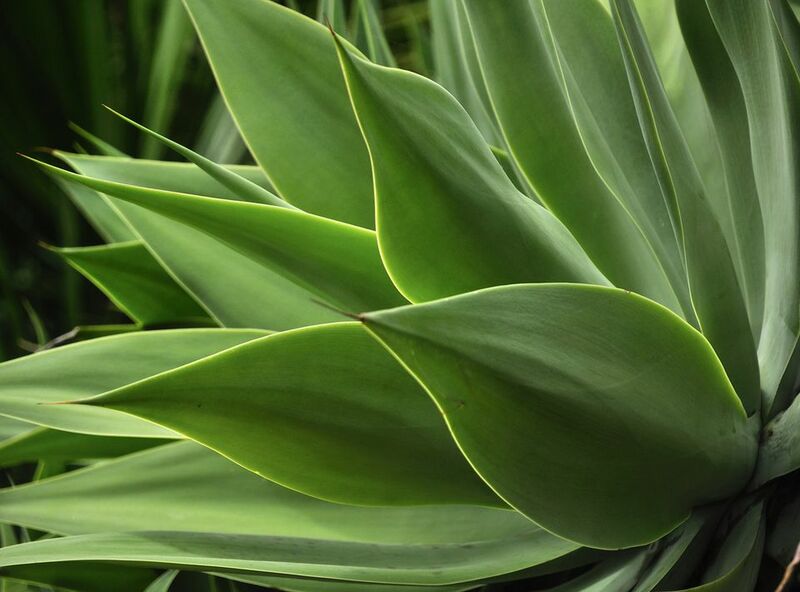 Leaves: Agaves are all stemless, or nearly so, with strappy, succulent leaves that end in sharp points. Foliage tends toward a blue-green in hardier varieties and a gray-green in warm climate varieties. There are also some that are variegated with gold or white markings. Flowers: When the plant matures, a tall, flower-stalk grows out of the plant’s center. The flowers are bell-shaped and long-lasting, in shades of white, yellow and green. For most agave species, once the flowers produce the berry seed pods, the plant dies. Agave plants are generally referred to as agaves. Agave americana as the Century Plant and that common name is sometimes confusingly used for all species of agave. Most agave plants are not frost-hardy, but there are some, like Agave parryi, that are reliably perennial to USDA Hardiness Zone 5. However, the majority of them are only hardy in USDA Zones 8 or 9 and up. Agave plants need a spot in full sun to partial shade. The hotter the climate is, the more shade they can handle. There is a lot of variety in the size of agave plants. They can mature from a few inches tall to 20+ feet in diameter. Agaves are grown for their dramatic foliage, not their flowers. That's a good thing because they bloom only once when they are fully mature. That can be anywhere from 5 to 40 years. Agave plants tend to bloom earlier in cultivation than they would in the wild. Most plants die after flowering. However, there are usually small offset plants at the base that can be replanted. One large agave is all that is needed to make a sculptural focal point. Just make sure there is plenty of room to walk around it, so no one gets stabbed. They can also make a nice border grouping, either by planting several of the same species or a tapestry of different varieties. They are textural and sculptural and make a vivid contrast with other plants. Pairing them with ornamental grasses softens their hard edges. In warm climates, agaves are popular around pools and patios. Their leaves don’t brown and drop frequently, and they stay attractive all year. A spineless variety, like the Foxtail Agave (Agave attenuata), is a safe bet around heavily used areas. Smaller agave plants are excellent for containers, indoor or out. Agave attenuata - A popular spineless variety also known as the Foxtail or Dragon-Tree Agave. It grows about 4-5 feet tall and a bit wider. Agave parviflora - Leaves have white, graphic markings and curling filaments that give it a hairy look. It only gets about 6 inches tall and blooms in 6 - 8 years with green flowers on a 4-6 ft. spike. Agave tequilana azul - Weber's Blue Agave is used to make tequila, in Jalisco, Mexico, but it is also a very attractive garden plant, reaching upwards of 6 ft. tall and flowering in 6 - 8 years with a 15 ft. spike of yellow blooms. Agaves thrive on neglect. They grow quickly and remain attractive all year. Here are some tips for getting your agave plants established. Propagation: Since it can take years for an agave plant to produce seed, most are propagated by offsets or tissue culture. Soil: Agave will tolerate any well-draining soil, but their preference is rocky or sandy soil. They are not particular about soil pH. Water: Although mature plants are very drought tolerant, when you are first establishing a plant outdoors, water it every 4 - 5 days for the first month. Then once a week, gradually spacing watering to every other week, depending on the weather. Feeding: Don’t feed agave plants. Agaves seem to take care of themselves. Feeding encourages flowering, which you don’t want to happen too soon since agave plants die off after flowering. As with many succulent plants, agaves are shallow rooted. You can grow them in any size container because they don’t need much soil. Use a well-draining soil. You can mix your own with something like 2 - 3 parts potting mix and 1 part gravel. Re-pot container grown plants every couple of years, with new soil. Agaves can produce sucker roots. If the pot is overly crowded with roots, go ahead and cut the roots back to size. Give the plant a week or so to readjust, before you water it again. Water about once a week in the summer and monthly in the winter. Wait until the surface of the soil is dry, before watering. In extremely dry conditions your agave may need more frequent water, but agaves are very forgiving. More on growing agave as a houseplant. Agaves have very few problems. The agave snout weevil will burrow into the plant’s center to lay its eggs, causing the plant to collapse. Unfortunately, you probably won’t notice this until it’s too late. Remove the plant and check for any remaining grubs. More Drought Tolerant Succulent Plants to Grow.